photo: Natalie Amos had 32 points in the win over Everett. photo by Rick May. Freshman Natalie Amos defined the term ‘on fire’ last night, as she poured in 32 points leading Bellevue to an 84-71 win. Amos was unstoppable all over the court, shooting 15-for-18 from the field, and also led the ‘dogs in assists (6), and steals (5). Amos got off to hot start in the first quarter on perfect 4-for-4 shooting as the Bulldogs took an early 19-13 lead. Bellevue took a comfortable 35-25 lead into halftime and maintained the momentum and scoring spree through the final quarter in which the Bulldogs put up a season-high 30 points. Amos scored half of her points in the fourth quarter alone which helped BC separate themselves from the Trojans. Amanda Luckett had 21 points and led the Bulldogs with 21 rebounds as the team’s control underneath gave them a 52-33 advantage in rebounds. Bellevue’s win keeps them on pace for a shot at the region title as they move to 5-2 in league, just one game behind Olympic. The Bulldogs have a week off as they prepare for the second rotation of league play which begins next Wednesday February 6 with a 5:00 tipoff hosting Peninsula. 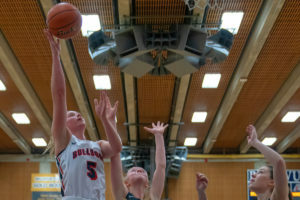 The Bulldogs won a nail-biter 51-50 at Peninsula on January 9 in their league opener.